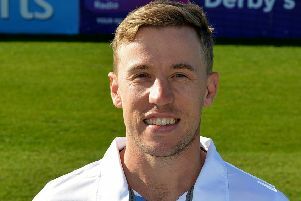 Alfie Gleadall was able to reflect on a satisfactory first two days of County Championship cricket after Derbyshire ended day two of the Division Two match at Durham on top. Before rain brought a premature end to the day, Derbyshire reduced the home side to 155 for six after taking a 109-run lead from the first innings. They claimed wickets at regular intervals in the second innings, led by Duanne Olivier’s 3-51. Gleadall, making his first-class debut, scored a vital 27 not out at number 10 as the visitors totalled 205 ahead of making inroads into the Durham line-up for a second time. His runs — adding 57 for the ninth wicket with Tony Palladino (32) — added to his first innings wicket. Gleadall said: “I was quite chilled when I found out I was making my debut. “It was nice to get that first wicket. It has been a good experience for me. “I couldn’t think of a better group of lads to be making my debut with to be honest. They’ve all been great. “It’s good to have Hardus (Viljoen) and Duanne in the team to help me out. They’ve given me a few tips on how to go about it. There were a few nerves when I was about to bowl my first ball. After that I was okay. On his late stand with Palladino and Derbyshire hopes of a win, Gleadall added: “Myself and Tony stuck in there and we tried to be as positive as we could, especially on the wicket on day one — it was doing a lot. “The wicket got a lot easier this morning to bat on. So it was good to get some runs. Derbyshire began the day 175-8, with Tony Palladino and Alfie Greadall adding valuable late runs to the cause. They guided their side over the 200-run mark before the visitors were dismissed for 205 and a lead of 109 as Matt Salisbury and Chris Rushworth claimed the final two wickets. Without stand-in skipper Cameron Steel due to a bruised arm, Michael Jones moved up to partner Latham at the top of the Durham innings. Latham survived an early scare as he was dropped by Alex Hughes at second slip off the bowling of Hardus Viljoen for nine. However, Jones was clean bowled by Viljoen with a precise yorker to make the breakthrough. Graham Clark joined Latham in the middle and the duo put on a 50-partnership to calm proceedings, making serious inroads into the deficit. Clark had settled into his innings, but then played a loose shot when Hughes entered the attack to lose his wicket. Will Smith lost his composure immediately on arrival, top-edging a delivery from Viljoen straight to Callum Brodrick at backward point. Latham continued his resistance by making his first half-century of the County Championship season in his first appearance in the four-day format on the term. He displayed patience, reaching the milestone in 104 balls, finding the boundary six times. However, Olivier returned to bowl from the Lumley End and produced a fine delivery to remove the New Zealander. The ball rose to take the edge, allowing Wayne Madsen to take the catch at first slip. Olivier snagged the wicket of Ryan Davies in the same over before trapping Josh Coughlin lbw for nine to leave Durham in huge trouble with only a slender advantage. Gareth Harte and Steel, batting at eight due to his injury, managed to see off the visitors’ surge, edging the lead towards 50 with a solid defence. Rain came down at tea and it prevented further play on day two, although Derbyshire remain in an incredibly strong position with two days remaining in the contest.